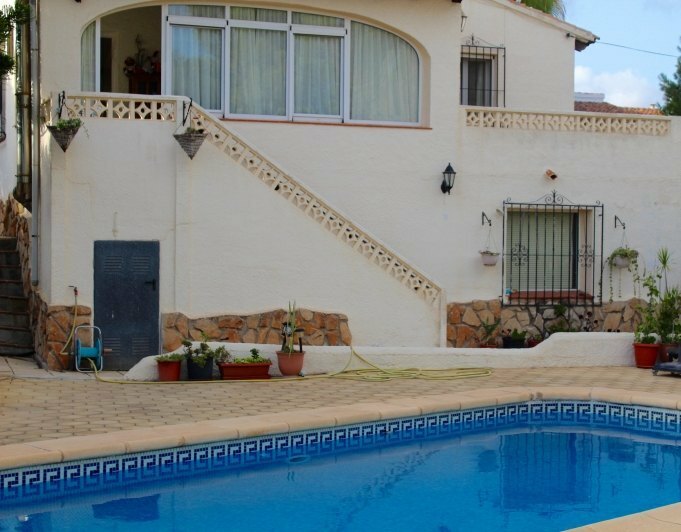 This beautiful property is set within a well maintained community in Moraira, area of Benimeit, it's elevated position gives it one of the most impressive views in the area, all the way from Moraira to Calpe following the blue colour of the mediterranean sea. Access to the property is via a private road of the urbanisation which leads to the single parking space on level with the main entrance door, from here a traditional wooden door opens into the bright open plan living/dining room with american style fully equipped kitchen, all with plenty of natural light. From the living area one step takes us to a beautiful office/reading corner leading out to the top terrace with again breathtaking views. An internal staircase leads down to the ground floor of the property which comprises 2 spacious double bedrooms with fitted wardrobes, utility cupboard and family bathroom. A set of double doors from the main bedroom lead out to the small private garden with mediterranean planting and beautiful views. On this level we also find a spacious underbuild, currently used as storage, but it could also be used as wine celler. The property boasts offroad parking, community pool, gas central heating and beautiful sea views. 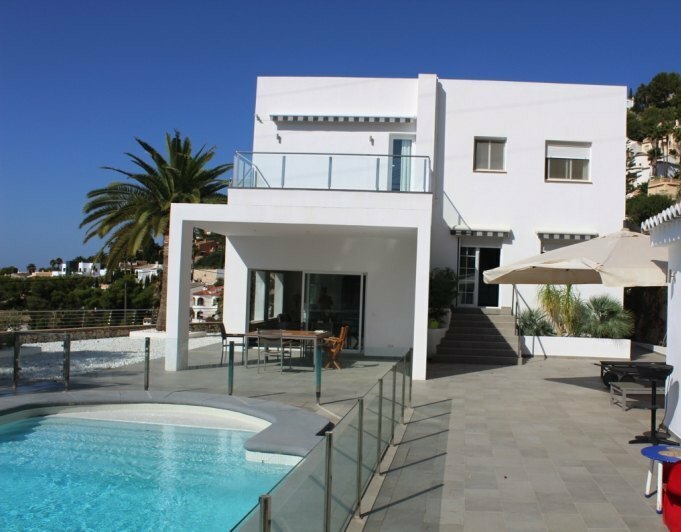 Well presented 200m2 villa elevated on the pretty hillside of Benimeit to appreciate beautiful sea views. Built on a good sized plot of 1080m2 affording a totally low maintenance garden with 8m x 4m kidney shaped pool. The gardens enjoy various plants/fruit trees and well positioned hedges to enable a completely private pool area.The main villa is accessed via a spacious driveway with ample off road parking and direct access to the garage. Distributed over two levels the main accommodation is upstairs and comprises new American style fully fitted kitchen with open plan lounge/dining area, the lounge has traditional wooden beam ceilings, corner stone fireplace and large French windows that lead out to the glazed naya where you can enjoy the sea views. To the left of the kitchen there is double bedroom 1 with built in wardrobes, family bathroom and double bedroom 2 with doors that lead to a private terrace area.The lower level (with its own separate entrance) can be accessed via the glazed naya or directly from the pool terrace. This level consists of 2 x double bedrooms both with built in wardrobes and a shower room. This floor also has direct access to the garage/storage room.Affording, double glazing, garage, off road parking, plenty of storage and a peaceful location. This lovely detached villa is located within the area of Coma de Los Frailes in Moraira, only a short drive into Moraira, this property affords panoramic sea and mountain views,Parking offroad on road level gives us access to the ramp that leads down to the entrance of the villa which a set of featured wooden doors takes us into the large entrance hall of the villa with big staircase leading to the upper level. On the ground floor there is a spacious living/dining room with fireplace and access to the long open naya which opens out to the south facing pool terrace, next to the living room there is a separate fully equipped kicthen. From the hallway we go straight through the corridor to a guest double bedroom and downstairs family bathroom.On the first floor we find 2 further double bedrooms (1 with built in wardrobes), 1 single bedroom with private terrace and a family bathroom.The property benefits of airconditioning hot and cold, private 8 x 4 rectangular pool with roman steps, good spaces, easy to maintain gardens and panoramic sea and mountain views. 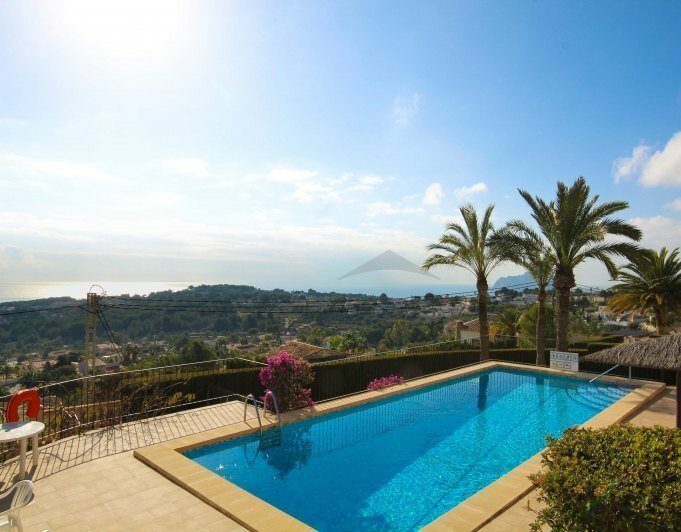 Beautiful villa with sea viewsSet in an exclusive development of classically modern designed villas, this stunning property is ready to move into and is only a 5 minutes drive from Moraira, Benissa and Teulada. 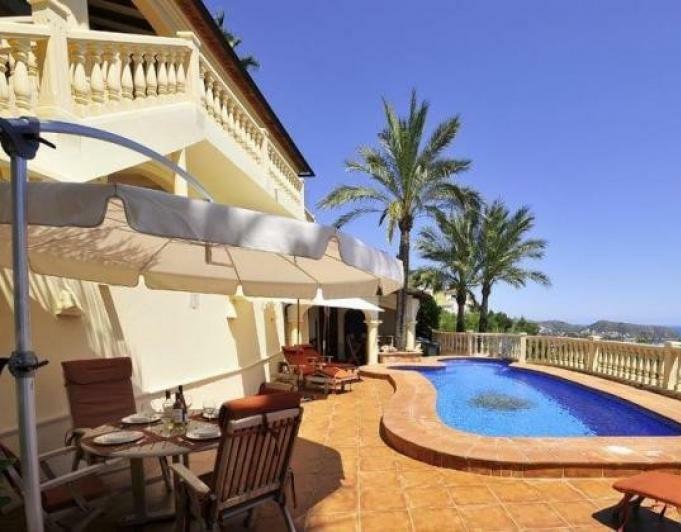 With fabulous sea views towards Calpe, this villa has everything required of a luxury Spanish property.On entrance level the main living area has a beautiful open plan lounge and kitchen area plus dining room. There are patio doors the entire pool side giving fabulous light into the property and which open out to the beautiful pool and summer kitchen area with ample room to enjoy the sunshine and views. The grand master bedroom has a dressing area and large ensuite and it also has patio doors out to the terrace. There are 2 further double bedrooms on this level, a guest bathroom and a cloak room.Down an internal staircase there is access to the double garage plus a separate 1 bedroom apartment complete with games room, sauna and shower.This villa has under flooring heating plus airconditioning and is in perfect condition to move straight in. 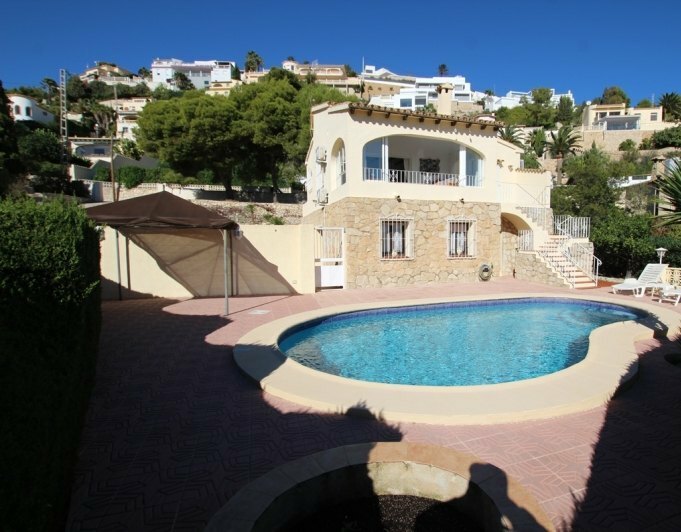 Villa for sale in Moraira with sea views. Villa with a view,This is a large three bedroom villa set in a popular area of benimeit Moraira with lovely open and sea views.This property has been constructed with good materials and finished off to a high standard with the use of Tosca stone arches and traditional terracotta hand made floor tiles.As you entre through the gated driveway which has ample off street secure parking. Leading down from this area are wide flowing steps down to the principal front door, which gives way to a large internal entrance hall, lounge dining room and kitchen. Leading from the lounge there is access out to a large balcony which is south facing and has lovely open and sea views. Leading off the lounge there is a guest toilet and a large master bedroom with a large ensuite bathroom and dressing room. To the opposite side of the property there is a large guest bedroom along with an independent shower room.Leading down to the lower ground floor level there is an second lounge, kitchen and guest bedroom. 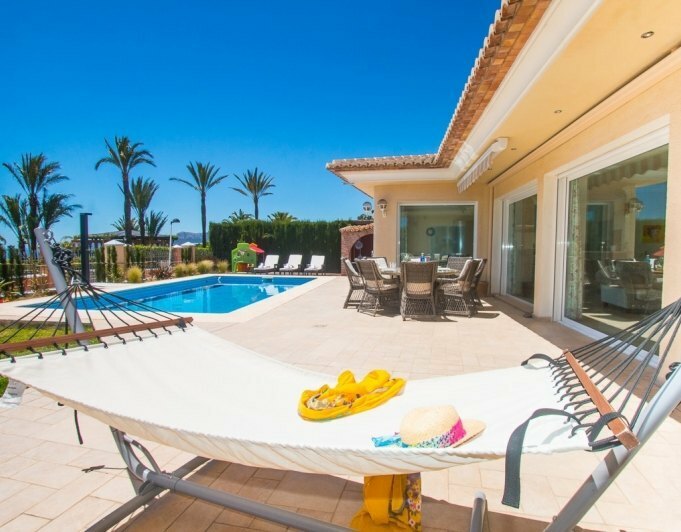 From this area you lead out to the large pool and terrace area, which benefits from a summer kitchen/BBQ, and a shower area.There is also access via spiral steps up to the roof terrace.This is a lovey spacious villa being sold at a realistic price. 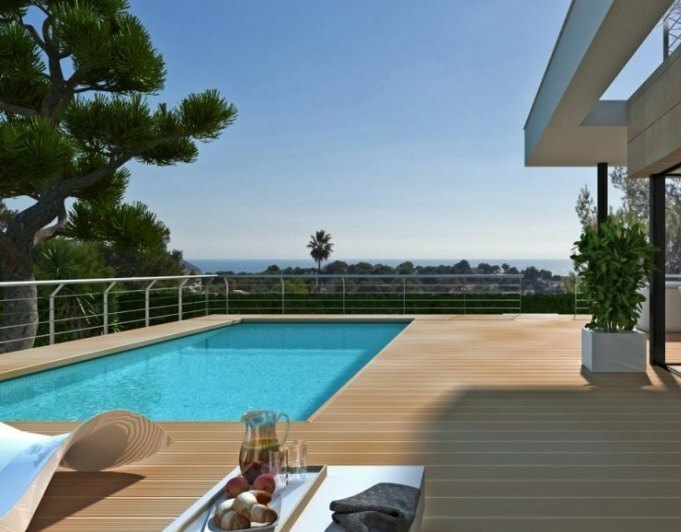 A new build contemporary villa, bright and airy and with open spaces, ideal for modern living.The detached property of 176,70 m2 with 30.36 m2 of porch, built on a plot of 835 m2, in a privileged area and with beautiful sea views. The location is ideal, about 700m from the small shopping center of Tabaira, 1.3km from Carrefour shopping center and about 2.5km from Moraira and its beaches. The urbanisation is brand new with new streets, central gas, underground cables, connection to the mains drainage network and street lighting.The project includes a carport for 1 vehicle, 9×4 rectangular swimming pool with preinstallation of heating, pool terrace of 100 m2 with stainless steel railing, boundary wall and fencing. Motorised vehicle gate and pedestrian gate with interphone. Built in BBQ on the exterior terrace.Driveway of approx. 150m2 of reinforced, patterned concrete to include various decorative planters.The fitted kitchen will be Dica mod. Milano 45 polar white laminated combined with bleached elm or similar, Bosch range appliances, Frecan extractor fan, white silestone worksurfaces in Northern white. Internal doors lacquered in white and with stainless steel door handles. Built in wardrobes, in white, with sliding doors.The exterior carpentry will be anthracite gray aluminum model Technal SOLEAL FY. Double glazing and security glass.Preinstallation of air conditioning, TV and telephone points in bedrooms and living room. All rooms will have halogen ceiling lights and there will be automatic roller blinds in bedrooms.Down lights will be installed in the kitchen. The electrical mechanisms will be Jung LS990. 2 led lights will be installed in the pool and various light points in the boundary walls.The villa will benefit from underfloor heating, installation of solar panels and a Junkers Smart mixed boiler. The bathrooms will have wall mounted Dama toilets, Vanity units, taps Hans Grohe, washbasin model Focus, Shower will be model Max de Tres.A perfect property for modern living, with first class finishes and details. Fantastic luxury villa with panoramic views to the sea, situated in a quiet area within walking distance of the town of Moraira.Built in 1995 and completely renovated in 2006 with first quality materials.This villa has five rooms distributed in two bedrooms upstairs, one of them with ensuite bathroom.Also find an a spacious lounge with fantastic views of the bay, a dining room with an american kitchen, a bathroom and a large covered terrace with barbecue. All the rooms on this level have direct access to the pool.The lower level has a separate entrance ideal for guests or relatives with three bedrooms, a dressing room and a bathroom. There is also a laundry room that can be turned into a kitchen.Also on this floor is a pantry and a large wine cellar. Benimeit Luxury Villa for sale Luxury Villa for sale finished of high standard with panoramic views of the sea. This luxury villa has lovely gardens with a large 10m swimming pool in addition to integrated jacuzzi. There is a kitchen and outside barbecue area and a garage with ample parking space. The villa has heating floor heating and ducts of air conditioning cold and heat everywhere. The master bedroom has a large closet flush with several terraces. There is also a guest apartment. The Moraira area guide is undoubtedly one of the most beautiful villages of the Costa Blanca. Situated on a Bay with breath taking panoramic views over the Mediterranean Sea and located between the sea and the mountains, this stunning fishing town is located. The atmosphere is of relaxation and tranquility, with a Marina, an excellent selection of elegant shops and a weekly open market. There are many restaurants and bars in the area that offers traditional cuisine Moraira town and Spanish Navy with fresh fish and paella to be a specialty. There's a strong sense of culture and tradition in Moraira and, along with many other Spanish cities, there are many festivals held to preserve its history. Historical Portet Bay was once a refuge for vessels and the Tower of the Cap d'Or is located at the highest point of Cap D'Or (Golden Cape) and was used as a legacy of protection against attacks from the Berber pirates in the 6th century. For tourists and residents alike, there are many places of interest to visit. The villages of the surroundings of Denia, Jávea, Calpe. and Altea offers everything one would expect from a beautiful coastal retreat. Along the coast there are many bays and breathtaking sandy beaches and a little further from the cities of Alicante and Valencia offer the Spanish tradition along with the hot spots of the city. Inside, only steps away from the milestone Valley famous for its Almond Blossom is in spring (Costa Blanca means White Coast and is said to be due to the almond bloom that covers the Earth). Acres of vineyards producing Muscat grapes surround the Jalon Valley and many excellent wineries (Bodegas) can be found there. This exceptionally stylish villa would make a perfect permanent family residence or an idyllic holiday retreat. Located in Benimeit the villa benefits from stunning panoramic sea views. Entering the property through the main entrance hall you can´t fail to be impressed by the stunning wooden floor and elegant staircase. The hallway provides access to two sitting rooms, both having excellent sea views, steps down lead to a large garage and a cloakroom. Heading up a few steps is the kitchen with separate island unit and dining area, from which there is patio door leading down to the pool and terrace. Taking a few steps further up are 3 spacious double bedrooms, one is fully equipped with wall mounted concealed bunk beds. A large family bathroom with double sink unit is also found on this floor. There is also a large office which could be used as a fifth bedroom. Several stairs then lead up to the master bedroom suite, with terrace and balcony and ensuite bathroom. Outside is an incredible garden area with spectacular sea views from all areas, a purpose built summer kitchen is ideal for preparing al fresco dining for family and friends. There is also ample storage and an outside shower. This is a wonderful luxury, family villa! 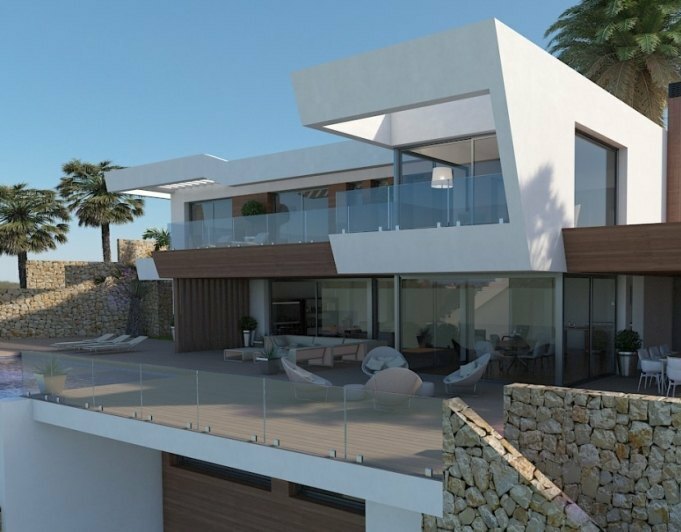 This modern villa with stunning sea views is a new built Project in Moraira.​The property will be built on 3 floors, one of them below ground level and the other two above. In the undebuilt there will be a garage with space for two cars, one wash room, storage room and machine room. The Access to the villa will be through the ground floor where there will be a totally equipped kitchen, living/dining room, one bedroom, 2 bathrooms and the starircase to Access the top floor where there will be 3 bedrooms, 3 bathrooms and a open terrace. The walls of the property will be glass, to be able to see from every corner the spectacular views. The same views as there will be from the infinity pool.There will be a lift connecting the 3 floors and also underfloor heating. 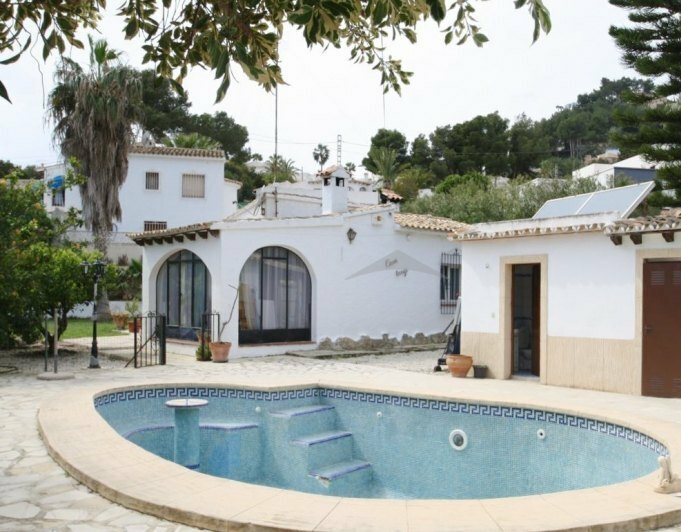 If you are looking to buy a spacious, modern villa close to the sea, Costa Blanca Dream Home offers fantastic villas for sale in Benimeit - Moraira (Alicante, Spain). These fabulous villas are located in a key point of the city to enjoy all the wonders of the Costa Blanca. 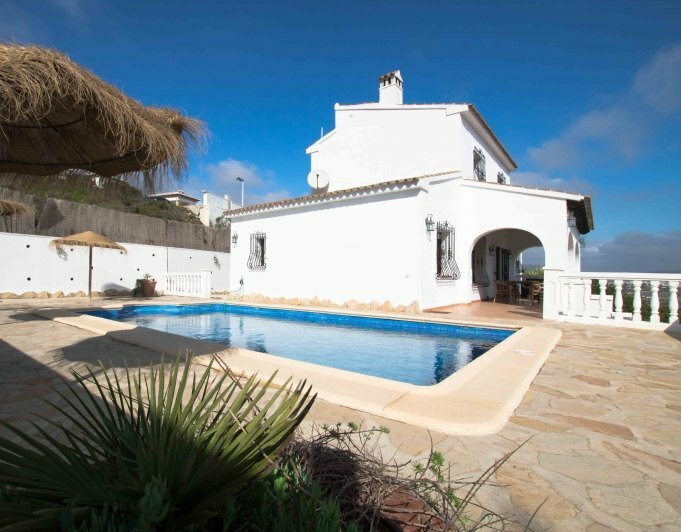 In the area of Benimeit and Moraira in general, the weather is incredible all year round and in summer you will be able to make the most of our villas for sale. Enjoy fantastic sea views from the Benimeit area as this is one of the strengths of our villas for sale in Benimeit. 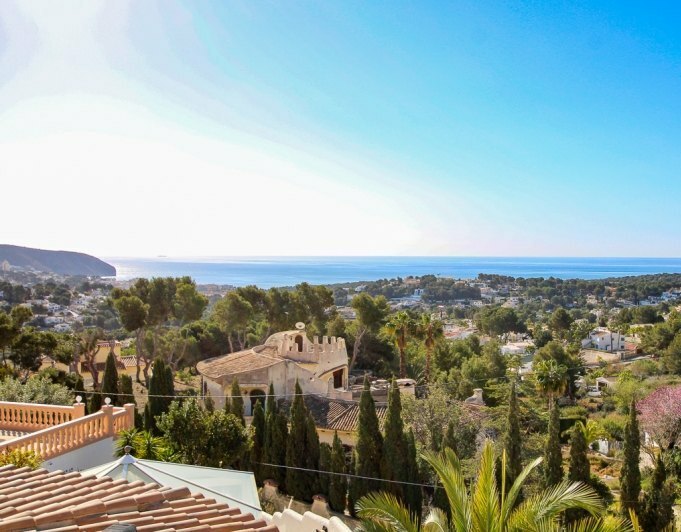 From your new villa in this very special area of Moraira you will be able to enjoy incredible views of the Mediterranean coast which will undoubtedly be the envy of your friends.